In order to provide a safe environment for children and to alleviate as much traffic congestion as possible, I would ask you to read and follow these guidelines. 1) Do not park in the Student Drop-Off Loop. 2) Use the Student Drop-Off Loop only for dropping off students. 3) When dropping off students, pull up as far as possible. (from the right side of the car only). 1) Do not enter the Bus Loop. Leave the area in front of the school free for school buses and always give the buses the right of way. 2) Park in the lot, meet your children at a pre-arranged location in front of school and walk them to your car. Do not have them walk by themselves to your car in the lot. Drivers backing up may not see them. 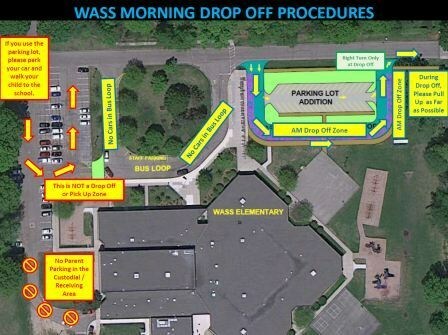 3) You may also park in the Drop-Off Loop at the end of the day. 4) Remind your children not to walk between parked cars in order to get into cars. 5) Consider parking on Highbury, English, Willard, or Crowfoot and having your child walk over to the car. 6) If someone else, such as an older sibling or grandparent, is picking up your child, please share this information with him or her. 7) Since children are not always paying attention, it is very important that adults are. Therefore, we ask that you do not use cell phones while driving near the school. 8) We encourage students to walk or ride their bikes to and from school. Drop your child off at 8:25 instead of 8:35. If each of the 290 Wass families drop off their child at the bell, all students will not be able to get to class on time. Have your child walk or ride a bike to school daily (weather permitting). Park on a neighboring street and have a meeting place with your child. Remember – We only have 140 parking spaces for 290 Wass families and over 40 staff members that serve our students. We need to work together to provide a safe environment in all areas of our school. I would like to thank you in advance for adhering to our traffic policies and procedures. It’s in the best interest of ALL STUDENTS. Every Student! Every Day! Go Wolves! Drop Off Guidelines – PLEASE READ AND FOLLOW THESE GUIDELINES FOR EVERYONE’S SAFETY!!! • All parents stay in their vehicle. • No texting or talking on cell phones. • Pull all the way forward to the end of the circle drive.